Simple to use, and complements any decor. 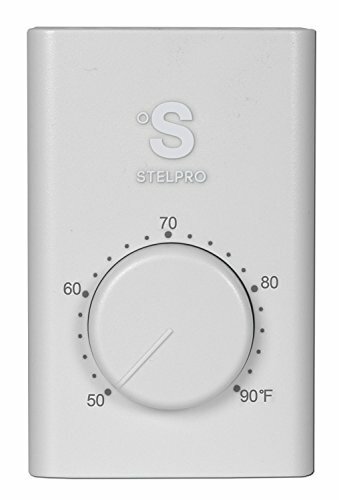 The SWT1 is has a white hard plastic cover and a easy to use s large knob that displays 50 to 90 temp range . There is no guessing with (Cooler, Comfort, Warmer) . The SWT. single-pole (two-wire) line voltage thermostats. It works with 120/240-volt electric heat systems with an electrical rating of 22 amps (resistive: 2,600 watts at 120 VAC/5,000 watts at 240 VAC) its easy to install and fits into a single wall-mounted junction box and can, replace virtually any two-wire line voltage thermostat. • Single Pole means it cuts power to the Hot wires only. • Not designed to be painted at home. If you have any questions about this product by STELPRO, contact us by completing and submitting the form below. If you are looking for a specif part number, please include it with your message.